Friday, November 22nd, 2013, 19.30 SHUT UP AND LISTEN! AWARD 2013 Award ceremony and presentation of selected works As part of this year’s festival, composers and sound artists were invited to submit works in two categories. Category 1) Electro-acoustic Composition Category 2) Composition for Violoncello solo resp. Violoncello and Sound Projection / Live-Electronics Contributions should show a reference to the festival theme END LESS NESS and have a maximum duration of 10 minutes. The participation in this competition is free of charge. No age limit. The entire selection process was anonymous. Out of 55 submissions from all over the world three works were selected which will be presented during the festival at Echoraum, Vienna on November 12st, 2013. 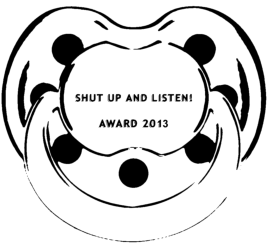 The award includes a purse of € 200.- each, as well as the SHUT UP AND LISTEN! TROPHY 2013. Winners and awarded compositions Helga Arias Parra (E/CH) Cellolar Synthesis For Violoncello and Sound Projection Jamez Dean (B/CH) Stone Whispering (a brick through society's window) (50% more) Electro-acoustic Composition Felipe Otondo (CL/UK) Night Study No. 1 Electro-acoustic Composition Jury Manon Liu Winter Pianist/Composer, Vienna. Michael Moser Violoncellist/Composer, Vienna. Gunter Schneider Guitarist/Composer, Sistrans, Tyrol.